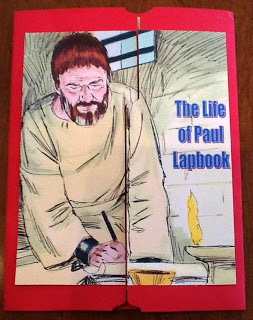 We will be using a lapbook each week while we study the life of the Apostle Paul. 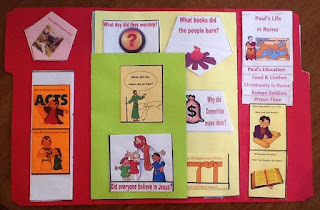 I will add each part when I add the Bible lesson to the blog. There is too much to add it all at once. But here are the pictures of what it looks like, and basically what to expect. I started with Stephen, since that is the first time we read about Saul. But, we ran out of time and didn't even get to the lapbook, so I will use Stephen as a review when we start learning about Saul/Paul. This lapbook will work best if you have a folder with the tab at the top (first pic). I print everything on cardstock, and use Aleene's Tacky glue to glue it. If you see on the second picture, I held the cover picture to one side of the folder and held it up the light. I made sure it was straight along the edges, and I tried not to cut on Paul's face. Then, I turned it over, carefully so I didn't shift it and traced the cut line. 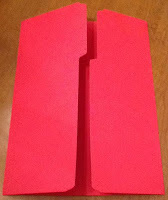 Then, you can glue the 2 parts of the front of the lapbook on. Lapbooks are different from file folder games. You still use a file folder, but lapbooks usually have extra parts attached inside to make room for more info, depending on how much you are adding. You can add pockets for loose papers also. I use clear packing tape to add the extra cardstock pages to the lapbooks. For this, I taped on the back of the green and taped to the bottom of the lapbook first, then added the lt blue (you will see in 2 photos down). I have tried every design and I use this style. It is the easiest for the kids to access and not get in the way of others at the table. Click on each title to download the printable. This is a Lapbook Linky Party & Blog Hop! Get ideas & inspiration & make new friends! I found you through Manic Monday. 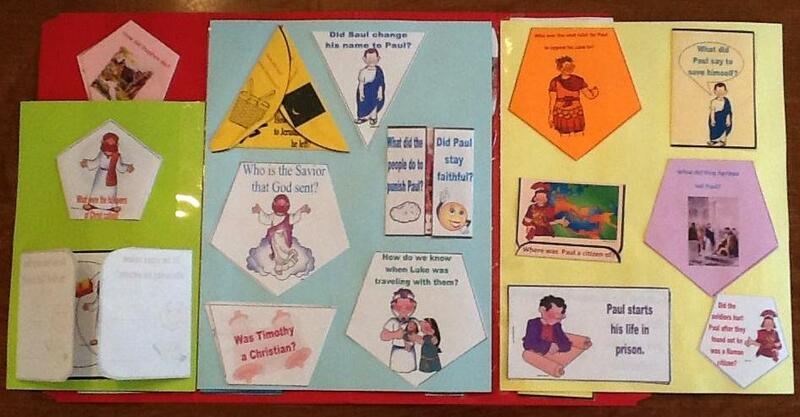 Your work will be perfect for Sunday school :) Thanks for sharing! Looks like a wonderful way to keep children occupied! This is so awesome!! Can't wait to do it with my daughter. Glad I saw it on Titus 2 Tuesday. Glad you like it and can use it! Thanks for the nice comment and for stopping by! This is so great! Thanks so much for posting. Its been so helpful with my preschool class. I'm having trouble with link #7 Saul's Name? Thanks so much! And, thanks for letting me know about the broken link! It is corrected now. I really appreciate it! What a wonderful idea!! Thank you for sharing at Sharing Saturday! 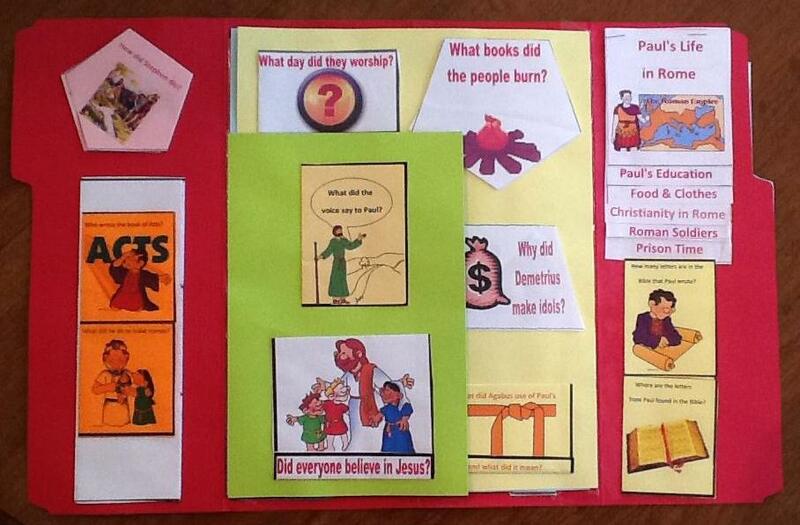 I am so excited to use the Paul's lapbook with the Bible class I am about to teach! I hope all the non-homeschoolers don't roll their eyes at lapbooking :) I am having trouble with the #7 Worship link, though. Thank you for sharing this! I am excited that you can use it! Most of the kids in my classes are not homeschooled, these are new to them, but they love them! It's different and that makes it interesting and a good way to review. Thanks so much for telling me about the broken link... I have corrected it! Thanks for the nice comment and for visiting! I am also having trouble with #10 Luke. All the others are ready to go! Thanks again! Question, if I am just teaching all your lessons to my daughter, should I have her cut and glue and put the lap books together? Or do you think it will be too much and I should do it? She is 3 now but I want to prepare some of the stuff for when I would like to begin teaching her. What is a good age to start; what is age appropriate for your materials? Thanks for visiting! The thing about lapbooks & file folder games is there are so many options and you can use them however they will work best for you. I babysit preschool kids, so I usually prepare everything, cut & glue then work on them with the kids. For Bible class, I have them all ready to use and we use them as review and Q&A. I know for most people that are using them for homeschool, the kids cut and glue as part of the project. For your 3 year old, you can do it either way, depending on her abilities, or if you want to work on cutting and gluing, do it together as a project. It can be her lapbook, and doesn't have to be perfect. It really is just your choice. Also, you don't have to use every printable and you can lay it out however you want to. I will have a lapbook post live on Feb. 13th if you'd like to see it. You have given me an idea though! I will make a simple preschool lapbook and let the kids cut & glue it for a post. They love crafts. So, thanks for the idea! Love this site! 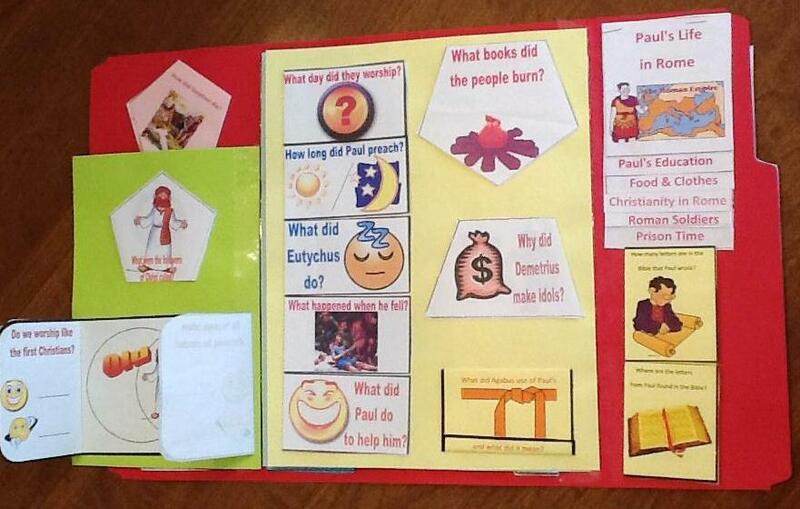 But...we are doing the life of Paul for VBS and I wanted to use the "Keys" visual (8. Key instructions for teachers) and it will not let me print pages 1, 3, 7 & 8. I have half of them done, but I can't do the others. Any suggestions? Great lessons! Your work is awesome! So much time and dedication! Thank you so much for sharing. I love it!!!! Love the application. I wanted to ask, if it would be alright to share with the Sunday School class. I printed the printables and have cut them out. They would be a great visual as we go over the lesson. They are all 4 years of age but taping the pics to the Popsicle sticks should be easy for them to do. I didn't want to do this with out your permission though. 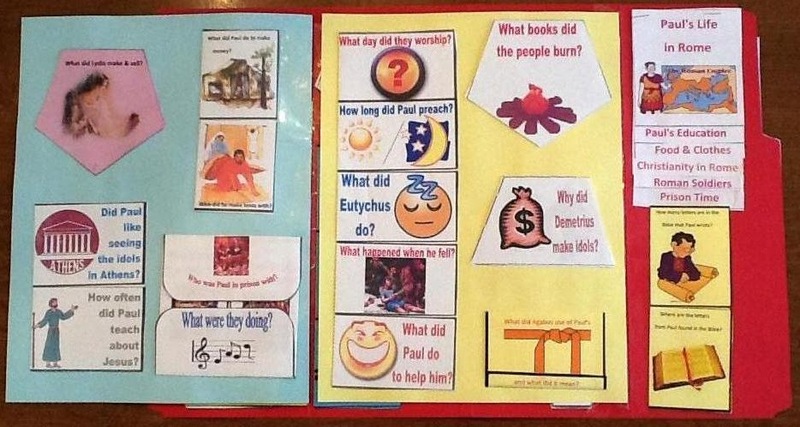 Frances, absolutely1 You can print, use and share anything on this blog in your classroom, mission work setting or VBS. I appreciate you stopping by! I recently found this lapbook project and am looking forward to working on it with my first and second graders in class on Wednesday nights. I have had some trouble finding instructions and lessons corresponding to the printouts. Is there somewhere that I can easily find those? You can use the search bar on the right to easily find a lesson you are looking for, or you can find a list of lessons for Acts @ https://www.biblefunforkids.com/2015/10/lesson-links.html although the search might find a newer updated lesson. Thanks for visiting.